I was at Thailand at the Traders’ Carnival, and only got back today. The conference was great and hit all the right notes, and there’s so much to write! But here’s one first off. 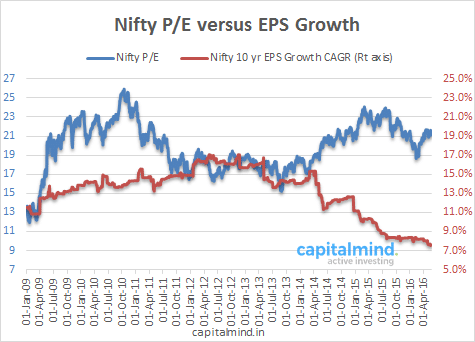 Samir Arora of Helios Capital had presented that the concept of using a one year earnings growth against the Nifty P/E wasn’t correct – in fact that the Nifty would go up and down and the P/E would keep shifting, as would EPS growth. He used a chart saying that if you work forward over the longer term, earnings growth would “catch up” with the P/E. Unfortunately his table seemed to end around the FY14/FY15 levels. 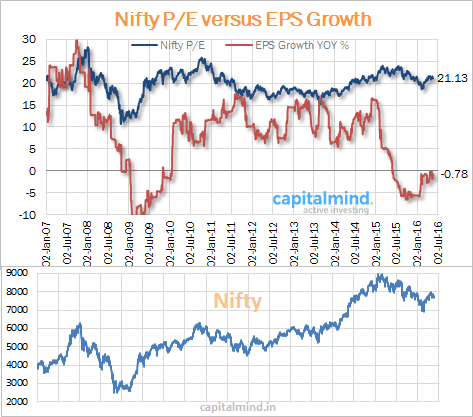 Samir is right, the 10 Year CAGR of earnings did catch up with the P/E ratio in FY13/FY14. But it hasn’t quite done so since then. Of course, in these 10 years, a number of stocks have been moved out of the Nifty because they were, to put it lightly, lousy. From DLF to Unitech to JP associates, some of the older holdings in the Nifty have had such bad earnings growth – or in fact the lack of any earning at all – that if you had held the stocks in the Nifty your performance would be further worse. This might sound like a bearish post on a day the Nifty is up 130 points, but it’s just a metric to note. When you’re running on fumes, sometimes you have to see the context to know you’re running on fumes. Of course, there’s always the big thing to say: India has potential, who else is growing at this rate, look at how much interest there is in India etc. This was true in the past of Japan and of China, and love for a fast growth country might not really last forever. The only way to reverse this cycle is to show some kind of earnings growth that isn’t as bad as what we have today. But remember: Markets don’t always care about fundamentals. Sometimes, even over the long term.